Gates of Stone, my epic fantasy debut, has now been published. I’ve written it under pseudonym – Angus Macallan – because it’s a different genre to my normal stuff – but I hope you will find it as engaging as the Outlaw Chronicles. I’ve decided to post the first chapter of Gates of Stone so that you can get an idea of the book, and maybe to whet your appetite just a little. (You can pre-order it here.) Katerina is one of the main characters, one of the best I think I’ve ever created. I hope you find her as interesting as I do . . .
Katerina stared at the skeletal body of the Holy Martyr. The long carved hands at the end of the jointed wooden arms were nailed to the fork of the Holy Tree above the Martyr’s head. The unnaturally stretched limbs and corresponding angle of the torso meant that the ribs were absurdly prominent. Indeed, the emaciated body on this Martyr gave the rack of bones a blade-like sharpness that Katerina had never seen on a statue before, and certainly never on any living person. You could slice gherkins on them, she thought, stifling an impious giggle. You could cut a loaf of black bread. This was the Southron style, she knew. She had seen these Martyrs at home in Khev in her governess’s picture-books, and once in a dusty chapel window made of broken pieces of coloured crystal which was tucked away behind the Imperial Palace. However, now that she was down here in this strange little backwater, now that an actual Holy Martyr statue was within spitting distance, she found the image grotesque – indeed, almost comical. Her family, which was as old as the ice-bears, had always given fealty to the ancient Khevan gods: brutish giants who strode about the heavens wielding hammer and lightning bolt and smiting humans whenever they grew bored of quarrelling with each other. But the Emperor had not forbidden the new faith, despite its oddity, and the worship of the Martyr was spreading fast throughout the Seven Principalities. Accordingly, her far-sighted governess had made sure that she had a firm grasp of the tenets of this bizarre new religion. The archbishop of this same faith, standing before the High Altar of the Basilica of Ashjavat, was mumbling on interminably about the sacred duties of a wife and mother. Katerina let the words wash over her, only sampling a phrase now and then to relish its absurdity, and continued staring at the extraordinary statue on the wall behind him. She scarcely believed in her own gods, and nothing, nothing on this wide Earth could induce her to give any credence to this ridiculous skinny half-naked wretch. It occurred to her that if the red and orange painted Flames of the Unbelievers had not been consuming the Holy Martyr’s stick-like white legs – and here she smothered another bubble of merriment – this malnourished fellow would certainly have expired from hunger in a day or so anyway. The same could hardly be said of the bridegroom looming at her side – Prince Khazeki might have embodied the very meaning of well-fed. Not that he was overly fat. Indeed, thought Katerina, stealing a sideways glance at him, he was passably handsome in an exotic Southron way: long, muscular limbs, broad shoulders and a barrel-like torso. His blue-black hair, high cheekbones and dark brown eyes – inherited, she assumed, from his mother, a Han Venerable from the vast rice-lands of the Celestial Republic to the east of the Empire – gave his looks a pleasing quality. His considerable weight, too, gave him a physical presence that was appealing. It was a shame really, she thought, that all this prime Southron manhood would soon be wasted. Prince Khazeki’s strong right hand was grasping hers, and she could feel the greasy mingling of their palm-sweat as the archbishop moved on to the part of the ceremony in which he sternly informed the newly joined couple before him that the fleshly side of marriage must only be undertaken for the purposes of reproduction. This archbishop was a ludicrous fellow with an enormous white beard, a stiff golden cape, and a baggy red hat embroidered with silver thread. Katerina could not look at him without wanting to laugh. A pair of massive solid gold urns stood at either side of the altar, one filled with the Holy Wine, the other with the Holy Oil and each tended by a junior priest in shining silver robes. Almost everything in the Basilica seemed to be fashioned from gold or silver – it was a dazzling place, no denying it, and Katerina had been rather impressed at first. Her young tastes had been forged by the austere sensibilities of the frozen north – dark pine woods, thick black furs, white plastered walls or plain grey stone, a discreet crystal vase here or there. Gold was scarce and used sparingly – one might catch the gleam of broach or belt buckle, perhaps see a single golden goblet set at table for the Emperor himself, but no lesser man. Here in the south, gold seemed as common as wood. From her governess’s geography lessons, she knew that this was because Ashjavat was the nearest of the Empire’s Seven Principalities to the Laut Besar, that legendary warm southern ocean studded with tropical islands. Gold flowed north from the Laut Besar, along with slaves and spices, timber and obat and wonderful tales about pirates, sorcerers, monsters and demons. Katerina stared at one of the massive golden urns, as tall as she was. That quantity of precious metal, she reckoned, could keep an Imperial Cossack regiment in black bread and gherkins for about two years. Her efficient governess had taught her about the logistics of warfare, the cost of supply, the quantities of materiel needed, along with everything else. She studied the distorted image of the pair of them, bride and groom, prince and princess, reflected in the curved side of the golden vessel. She looked well that day, she thought: in the traditional wedding colours of white and red. Her long, almost-white fair hair had been gathered into a single fat plait that hung down her back and threaded with ruby rosebuds; her lips had been given just the lightest a touch of cochineal; her large eyes, the pale blue of the summer sky over the Khevan steppe, had been skilfully lined with kohl; a crown of white roses adorned her pale brow; and the wedding dress – glossy Han silk the colour of poppies – fit her like a second skin. A long train flowed out behind her like a trail of blood down the steps from the altar where two of her bridegroom’s owl-eyed nieces clutched the silver-embroidered hem. At her narrow waist was a silver chain from which hung the five golden keys of the gates of Ashjavat – a symbol that she would hold the Principality securely for her new lord and master until death should part them. That was the bargain she had made today with this marriage of two strangers: and she would keep it. She always kept her bargains. Next to the keys hung a short, slim ceremonial dagger, the golden scabbard encrusted with rubies and diamonds, the symbol of her duty to use all and every means, even including deadly force, in defence of her husband’s rightful property. Yes, she thought, she looked well – as she should. It was her wedding day, after all. And the sixteenth anniversary of her birth, to boot. Katerina smiled up at her big, handsome Southron husband. Today was the day that her life could truly begin. The wedding feast had been interminable, a numbing succession of courses – one of the Ashjavat ladies had whispered to her that ninety-nine was the traditional number – served on magnificent golden plates but cool as contempt by the time they had made the long journey from the kitchens at the rear of the palace to the high table in the echoing Hall of the Ancients. Katerina had stopped eating after the twelfth course, and thereafter merely waved away the giant platters. The food would not be wasted, she knew, even when the two hundred or so noble guests who filled the lesser tables with their noise and stink were sated. The uneaten platters would feed the army of servants who had prepared the gargantuan meal and the scraps would be given to the poor who gathered at the gates of the palace in their thousands, awaiting their share of the wedding bounty. Instead of eating, she watched her husband, and dutifully filled his goblet with rich Rhonos wine, whenever it dipped below the half-full mark. She had only a single glass herself – savouring the sweet unfamiliar flavour as much as the knowledge that it had been transported two thousand miles from the Frankish lands at the western edge of the Empire to reach this table for her wedding feast. When the slave-dancers came out and began their swaying, sashaying routine, she caught the eye of the Captain of the Palace Guard on the far side of the hall, leaning nonchalantly on his long spear by the door and watching the graceful girls with an openly lustful eye. He was a notorious gambler and rake named Jan Artur, extraordinarily vain of his cheekbones and long black moustaches, but with a reputation of excessive, even reckless physical courage. He was handsome, yes. His brown muscular chest was bare and he wore the local loose silk trousers and a pair of pistols stuffed into a black sash around his waist. Artur stopped ogling the dancers and now stared directly at her, smiling broadly. The soldier wanted her, as she well knew; in fact she thought he was about three parts in love with her. That was good. She had deliberately set out to win his affection and loyalty by asking his advice as a newcomer to Ashjavat and flirting a little with him. Katerina had once playfully laid her small white hand on his smooth bare brown chest. Now he was very nearly in her pocket, hers to use for her pleasure or to dispose of just as she wished. Captain Artur grinned at her from across the crowded room; he even had the audacity to wink. Katerina stiffened. The man was indiscreet. He would never do as a long-term lover, she decided. Yet the captain seemed to have absolutely no fear of Prince Khazeki’s famous jealousy. Perhaps then some other practical use could be made of him. The princess raised her eyebrows, lifted her glass fractionally to Artur and drank the last sip of wine. After that single glass she drank only spring water for the rest of that endless meal yet she was, in spite of herself, deeply impressed by her new husband. For his capacity for drink, anyway. Goblet after brimming goblet was downed with no seeming effect but a slight reddening of his swarthy cheeks and a brighter glitter in his eye when he smiled over at her. She had attended a few of the boyars’ feasts back at home in the dining halls of the Imperial city, on one occasion being given the honour of sitting next to her father, Emperor Kasimir, as he lolled in the Ice-Bear Throne and basked in the false praise and boorish wit of his drunken guests. The boyars could all drink, even the youngest of those Imperial lordlings. It was said that a true Khevan went from drinking mother’s milk to throwing down the fiery marak grain spirit without stopping at anything milder in between. And the Imperial feasts had always been cacophonous affairs, reasonably decorous for the first hour and then descending into a riot of red-faced, bawling, sometimes brawling men – and women – who gorged and puked and stumbled about like the ancestral Barbarian Fathers, the sons of the divine sky giants. Even Emperor Kasimir, when he had been in his full strength, had swilled and sworn and yelled and wrestled with the best of them. She had herself had one vision-blurring glass of marak too many before now. More than once. He was swift and vigorous, and no more clumsy than some of the men she had straddled in the north, and once he had pumped his seed inside her and rolled over, they lay together naked, sweat cooling, legs entangled in the blankets and furs. He asked her if she was satisfied and she said that she was. In truth she was merely impatient, but she had played a part for as long as she could remember and it was not difficult for her to act the sated, sleepy lover. It had been a long and tiresome day. “Would my lord perhaps enjoy a pipe before he sleeps?” she said shyly, and when Khazeki grunted in affirmation, she slipped from the bed, quite naked, her flesh goose-pimpling in the cold air, and went over to the the pipe rack and the obat paraphernalia on the stand in the corner of the room. She opened the obat box and twisted off a lump of the waxy gum inside, rolling it between her palms to warm it and form it into two round balls. She selected a long cedar-wood pipe from the rack and carried it and the obat balls, candle and taper over to the side of the bed, set them down on the table. Khazeki completely ignored them. He gave her a lascivious smile and ran his eyes down her naked body. The second time took so much longer. He ploughed away endlessly, from behind this time, his hairy belly slapping noisily against her small buttocks, and at one point Katerina despaired of him ever finishing his rutting before dawn came and the whole household awoke. And then it would be too late. But he did, eventually, with one enormous thrust and groan, then he flopped on to the bed leaving her to stagger to the water-closet on trembly legs, there to squat and piss and wipe herself fiercely with a wiry hank of sheep’s wool. She mastered herself and came back smiling to the bedside. She held the long pipe to his lips and put the lit taper to the first amber ball of obat in the bowl. Khazeki sucked greedily at the mouthpiece, drawing in the smoke which he held, held as long as he could, then released in a long blue pungent plume. Katerina caught the sweet scents of wood oils, resin and the sharp burnt citrus tang of the obat residue. The expelled smoke passed before her face and she could not help but sip in a little of the blue vapour before it dissipated into the air. Even at second hand, it was a powerful dose and she felt a softening of the edges of her reality, tendrils of pleasure creeping down her spine and along her limbs. Khazeki’s eyelids were already drooping as she pressed the second ball of obat into the bowl and offered the pipe up to his lips. Once again he sucked in the dense blue smoke and breathed it out like a sleepy dragon. He lay back on the pillows and smiled at her, the pupils of his eyes now vast black holes that almost entirely eclipsed the brown iris. “You will make an excellent wife, Katerina,” he murmured. She smiled back lovingly, took a corner of the linen sheet and wiped a fine thread of drool from his slack lips. Then she walked around to the other side of her broad marriage bed and climbed under the blankets beside him. She lay still for a while, feeling the effects of the tiny amount of obat in her own bloodstream, and listening to his deep, slow breathing. Today was the day that her life could truly begin, she told herself. Today was the day. For a moment she pretended girlishly that she did not have the stomach for this enterprise. But she knew, deep in her core, that she did. It was a small thing. But the vital first step on the road she must take. His breathing had turned to snores. So, it was time. She slipped from the bed and walked quickly over to the pile of her clothes on the chest on the far side of the room. She slid the ceremonial dagger from its extravagantly jewelled sheath on the silver belt chain. She tested the edge on her thumb, it was quite blunt, of course, not being made for real combat but merely for display at the ceremony; but the blade was the length of her hand, the point was sharp enough for its purpose and the steel thin and strong. She stepped back over to the bed and looked down at the cheek of her new husband, even now prickling with a fresh crop of stubble. A hank of blue-black hair had fallen over his nose and she tenderly brushed it back into place. Then she placed the tip of the slim dagger an inch forward of his ear and, using both of her small hands and all of the weight of her shoulders, she shoved the blade down hard. There was a tiny noise – pock – as the steel punched through the thinner skull-bone at the temple and sank deep into his sleeping brain. Khazeki’s eyes flew open. His right leg kicked once. Katerina worked the slim blade, left and right, left and right, in its bony slot. And her new husband lay still. 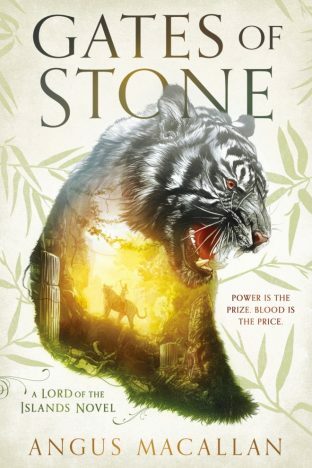 You can pre-order the whole of Gates of Stone here.